Remember when the perfect circle Photo Challenge came out? Well, this is where I was headed, the Golden Mean, also known as Fibonacci’s Ratio in photography. 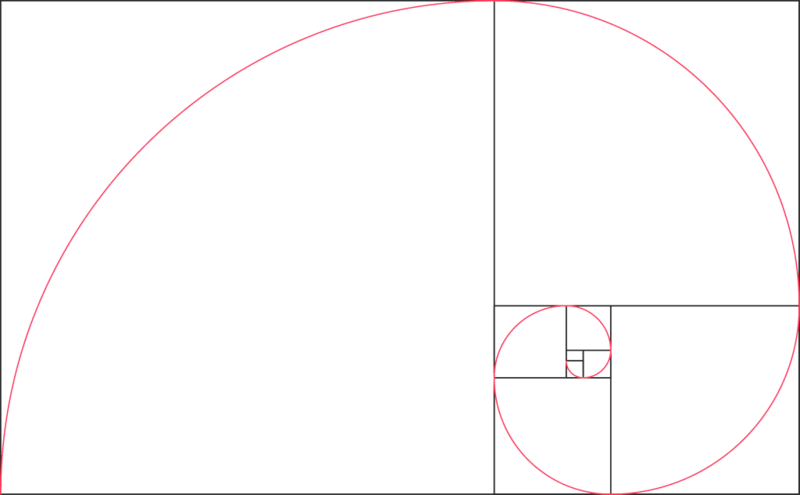 The Golden Mean is the formula for the natural growth and design. It’s basic fluid form and shape is what mathematically occurs when a straight line meets something round like the perfect circle and creates a spiral, such as a spiral stair case, a snail’s shell, the profile of a fist, the universe and much, much more… The mathematical formula was discovered by Fibonacci and is present in almost every natural form. I’m a big advocate that much of today’s photography equipment has become so complex that it actually in many cases distracts us from photography. Well, the Golden Mean Ratio can be as simple as a visual template in your head that helps you set your composition to be more visually pleasing. On the other hand, you can start researching the Golden Mean and the Fibonacci Ratio to the point of utter confusion. This can easily add up to, too much mathematics and logic for the creative mind of a photographer thus separating machines from artists. My true opinion is that you need to feel it and visualize it, but understanding it may just distract you from photography. if you start over thinking about the golden mean. The template is often referred to as the RULE OF THIRDS on STEROIDS. Although I represent it in one way above it can be flipped vertically, horizontally and in any way you want as illustrated below. If you were to superimpose them one on top of the other, you would get something that resembles the familiar grid we are used to seeing, the grid that helps us compose as per the RULE of THIRDS. This is so important when it comes to visual appeal that it is used as much in interior design and automotive design as it is used in graphic design and photography. It is also said that nature pretty much follows this mathematical formula with examples found as much in living animals, plants as it can be found in the arrangement of inanimate celestial objects such as galaxies. BELOW is an average everyday scenario in the life of a Google Street View Trusted Business Photographer. Photographing storefronts, interiors and even some 360 degrees equirectangular images. We can easily see our main subject’s visual interaction with its environment inline with the Golden Mean. Our subject is well defined, even within the rule of thirds. It’s association relative to items of interest is also kept fluid within an appealing field of view. The ensemble of the store remains noticeable but relatively un-distracting compared to a less organized composition. This is in no way a masterpiece, it’s an editorial image designed to represent a Nature Boutique in a National Park. Put together a series of well-composed images and your audience has a warm fuzzy feeling about the store you are documenting for a business on Google Searches. Proper composition or at least attempting to properly compose an image isn’t only for fine art photography, it can change your snapshots from OK to EYE-PLEASING and FLUID. The above image taken from a vehicle demonstrates the simplicity in applying the Golden Mean to your composition, while on the run. This is where I get stumped. I was a little bit indecisive on the approach I would take with the Golden Mean within a Photo Challenge. One idea was to follow in the footsteps of the perfect circle. Sort of a treasure hunt in search of items formed naturally or by the hand of man. The other was to concentrate on proper composition while applying the Golden Mean. This would be similar to last year’s Rule of Thirds Photo Challenge. In the end I opted for a mixed recipe that leaves the final decision up to you, the Photo Challenge Community Member. It’s not always easy to identify the Golden Ratio without a template to overlay in front of a specific design. It’s been in use as an approximation since before the Early Greek Civilizations. The image below from Tom Blackwell illustrates well how the details of the Golden Ratio can be present but not easily noticeable. Heinrich Cornelius Agrippa’s drawing of a man’s body in a pentagram suggests relationships to the golden ratio. In 1490, Leonardo da Vinci drew the Vetruvian Man within similar proportions based on the work of the architect Vitruvius. There is no lack of examples on the internet to get down and dirty with all the principles of the Golden Mean. One tool will be a template that you can superimpose on your image, or draw onto a piece of plexiglass the truly visualize your world with a different eye. Simply load the image and adjust the size as an overlay in a different layer above your image in Photoshop or similar image editing software. You can also draw it on a small piece of plexiglass to visualize your compositions live in the field. If you’re interested there are apps for smartphones that use or overlay the Golden Ration in a camera application to better compose with your smartphone. Please note that I haven’t used or endorsed these apps in any way shape or form. I just did a search for Android and IOS apps. I recommend you use only apps you researched yourself and that are downloaded from truly trustworthy sources such as GOOGLE PLAY or THE APP STORE. Take the time to read the reviews and make additional Google, Play Store or App Store searches to find the right app for you. This entry was posted in 2018Challenge, 2018Challenge-10th-Anniversary, 2018PhotoChallenge and tagged 2018, 52 weeks, architecture, camera, composition, design, Fibonacci ratio, flickr, galaxies, golden mean, golden ratio, interiors, january, leaves, nature, Online Communities, Outdoor, photo challenge, photochallenge, photographer, picture, portrait, rule of thirds, shell, snail, spiral, stairs, trevor, troletti, week, weekend, weekly, weeks, winter by Steve Troletti. Bookmark the permalink.